Have you been eating more sweets lately or snacking more cause of the upcoming summer? Well it’s time for you to eat healthy for a meal. 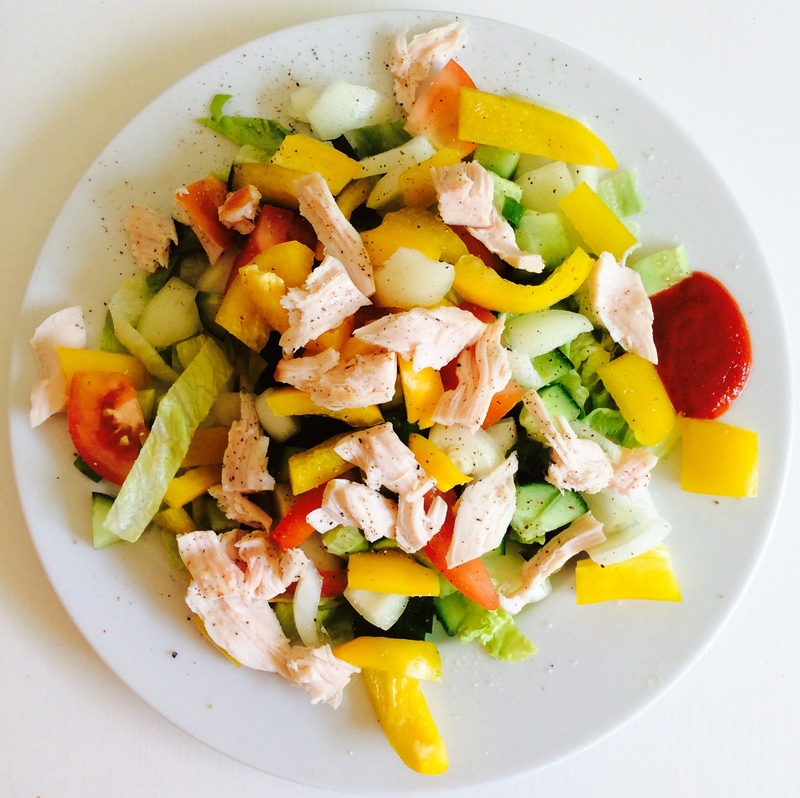 This is an idea for a simple healthy salad with smoked chicken and lots of vegetables full of vitamins! Inside this smoked chicken salad is lettuce, yellow bell pepper, tomatoes, onions, cucumber, avocado (optional), and smoked chicken with a little salt and pepper! And a little chilli sauce on the side which is completely optional . The yellow bell pepper in this salad is a good source of Vitamin C. Vitamin C can help you grow and repair tissues in your body as well as keeps your teeth and bones strong. It also is an antioxidant which protects your cells giving you a lot of benefits including anti ageing to all you ladies and men! The avocado contains healthy fat and is rich in Vitamin K as well as Vitamin B, Vitamin C and Vitamin E. It can help lower cholesterol and can lower the risk of diabetes. And of course chicken is a good source of protein! Next Post Is it breakfast time? I really appreciate it! You will see my post these upcoming days! Hey there! We’ve been following each other now for a while and I love your blog! It looks so good! Mind if I share some of your recipes with my followers?